Greyhounds learn at a different pace than most other dogs. Training a greyhound can be a little challenging, especially if you're working with a retired racing greyhound. These dogs begin their lives differently than the average dog that will grow up to be a companion. They need to unlearn some things before they can learn. Acclimate your greyhound to his new surroundings and give him time to become accustomed to life outside the track by taking him around and showing him his world. Racing greyhounds are confined to cages for most of the day, so everything is new to them. They have never seen children, for example, or stairs, or a swimming pool, cows, grass, cars ... the list goes on and on. If you try to think like a greyhound and understand that everything he sees is a brand new experience for him, you will be in a better position to understand his special needs. Build a trusting relationship with your dog. Bringing a greyhound to a training class or working one-on-one with a professional trainer is the best way to train your greyhound, but that comes later. When you first bring your dog home, you must give yourself and your dog time to bond. This does not happen overnight. The track employees may or may not have been abusive or harsh, but they certainly weren't warm and fuzzy, either. Your dog needs to learn to trust people, particularly you and your family. This may take a long time depending upon the dog's temperament, personality and life experiences thus far. Help him to get over any apprehension by spending time with him and playing with him. If you have another dog in the household, let them spend supervised time together. Greyhounds will mimic behavior. If you have a staircase in your home and your greyhound sees your dog going up and down the stairs, he'll learn by example. Teach your greyhound to trust you by not raising your voice and giving only gentle correction. Watch your dog very carefully and become familiar with all the special considerations involved in training a retired racing greyhound. Be protective of any small animals, such as cats or pocket pets, until you know how your dog will react. Greyhounds have been conditioned to chase prey, so take special care introducing your greyhound to household pets. Some dogs may not bother with these animals at all; others may have a higher prey drive. Also, some greyhounds have trouble with the "sit" command. Some racing greyhounds are not allowed to sit while waiting for the race to begin and are poked when they try, so they learn not to do it. Their anatomy also makes it a bit difficult for them to assume the position. When you start basic training, you may have to skip over this particular command or spend a little extra time on it. Then again, your dog may sit just fine. Just be aware that it is a potential issue. Be gentle with yourself and your greyhound. "Greyts" make wonderful companions once the initial adjustment period is over. Join a group with other new greyhound owners so you can share tips and ideas, compare notes and make some more "fast friends." 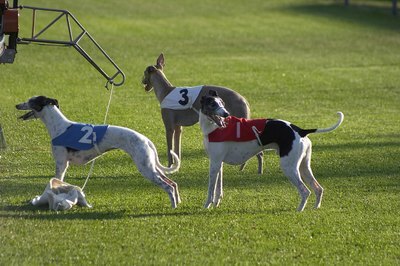 Choose a Martingale collar for your greyhound; it is made specifically for dogs with slender necks and heads. Never let your greyhound off the leash, not even when you think he is reliably trained to stay. Greyhounds are sight hounds; their prey instinct is triggered when they see movement. You will never catch a running greyhound, so don't take the chance. What Makes a Tetra Swim in a Circle? How Can I Get My Dog to Be a Service Dog? What Are Service Dogs Supposed To Do? Should You Put Dog Food Near a Pad When Potty Training? Do Border Collies Bark a Lot?